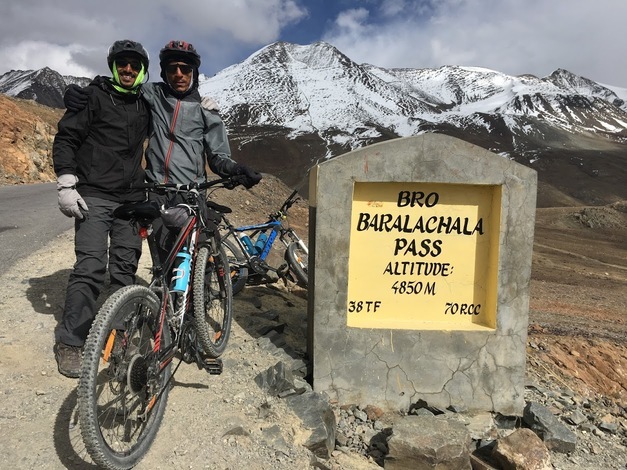 So, you cycled from Manali to Leh? How did you decide to do this? What is the maximum elevation you cycled to? Was it really hard? Why couldn’t you finish the ride? So, you do really need a support vehicle? How much did the support vehicle cost you? Did you carry your own bikes? Did the flights charge you for the bikes? Would you recommend me to carry my bike? What cycle spares/tools did you carry? What sort of preparation did you do for this ride? Can you share your ride plan? What was a typical day during the trip, like? What was the most enjoyable part of the ride? What was the most challenging part of the ride? You keep saying it was cold, how cold was it really? Did you meet any interesting people en-route? If yes, which part of the year would you do it? If not, what other routes would you try? Do you have any pictures that you can share? Well, Not really. We cycled from Kalath to Whiskey Nala – a distance of 280km – which is about 60% of the Manali-Leh route. Vivek and I were on the bikes. Shabu was our guide helping us fix our bikes and fixing up our meals, but more than anything else, ensuring that we don’t freeze to death. Susheel was driving along and cheering us. We started off at around 1.8km and went up to about 5km in a span of 5 days. We also spent a day in Manali, getting our cycles fixed and acclimatizing. You can see the elevation profile here. Our plan was to finish the whole distance in 7 days. We couldn’t get to our designated camp on the 5th day, and had to use the support car to get to camp before it got dark. We decided to end the ride once we took our bikes off the road. But, cold played a much bigger role than we thought it would. As we got higher and higher, it got so cold that we spent a significant amount of energy and brain cycles on trying to fight the cold, rather than enjoying the views or pushing ourselves to keep going despite the non-cold-related discomfort. Not really, if you were riding in better weather or were better prepared. The Manali to Leh route usually has a lot of temporary shops setup during the season, where you could crash, if it was too cold to just crash in your tent. Since, we were going after the season had almost ended, many of these shops were no longer open, and having the support car turned out to be quite useful on the last day. It turned out to be quite an expense for something we originally didn’t have in mind. We spent about 20k on the vehicle, fuel and the driver’s fee. We also paid our guide + cook + bicycle expert, separately. The carrier (IndiGo) from BLR to DEL charged us a handling fees of Rs. 1000. The carrier (Vistara) on the return journey didn’t. You could find bikes on rent, both in Manali and Leh, for about 500 to 700 per day. It would cost about 5-7k, based on how you plan your ride, to rent a bike. You’ll have to make arrangements to get the bike returned back to the place you rent it from – this can get a little tricky. If you already own a bike, and can it packed in a proper box, I would highly recommend that. The derailleurs, the shifters, and other such moving parts need to be well packed and guarded. Use a box or a cycling bag to put it in. Get professional help from a cycle retailer nearby, if required. This is one thing you cannot take any chances on, or your whole trip may be jeopardized! We hadn’t paid enough attention to packing our bikes, and one of our bikes took quite some beating on the way to Delhi. On the way back, we managed to get the bike packed in a box and it was a breeze. We did a handful of 50-100km rides on weekends before this one. The only real elevation training/trial that we did was the Kalhatti climb, one weekend before this ride. This turned out to be pretty useful, and we found all the other climbs during this ride much less steeper than some of the Kalhatti ones. 1 Kalath Marhi 45km 1675m Prepare to cross Rohtang! 3 Keylong Patseo 48km +644m Easy ride; Deepak Tal! 4 Patseo Sarchu 64km +522m Crossed Baralachala(4902m)! 7 Lato Leh 70km -600m Lots of downhill! Wake up between 7 and 8, depending on when you can see/feel the warm sun. Laze in bed if you woke up too early, and the sun hasn’t yet warmed the place up. Eat porridge, and a few slices of bread with peanut butter. Pack ourselves up in as many layers of clothing as we can, while still being able to pedal. Check the bikes for any loose/fallen-off/broken parts, blow, etc. Start pedaling away - usually between 9 and 10. It’s too cold to start earlier. Keep adjusting the clothing, based on how cold/warm it is, and the wind chill. Keep munching, or sipping on some water (plain or mixed with some energizer). Continue pedaling, and start looking at the milestones a little more carefully. Lunch is on our mind, already. Lunch at around 1:30pm - usually, a couple of boiled eggs, and a potato. May be a chocolate, and some Frooti. More pedaling. The kilometers start getting harder, the chill is getting harsher. Huff and puff, and reach our camp for the day. Hi-fives! We’d try and reach the camp while there is still some sunlight there to keep us warm. Stretch it out, and switch into dry, warm clothes. Grab a quick snack - whole packets of biscuits would just disappear, alongside some tea. Talk, walk around, ponder about life, think about the day that’s been, think about the day that is to come, and all that jazz. Eat dinner - dal and rice, mostly. Sleep like logs. Unless, there’s a rat in the room that’s attacking our dry fruits. The climb to Baralacha La was the most challenging part of the ride. We could see that the weather was really bad in all the peaks around us, and it was getting really cold. Briefly, it was even snowing very lightly and we could see tiny snow flakes floating in front of us. The feeling of reaching the top of passes was quite thrilling, for both Rohtang and Baralacha La. Nakee La, not so much, since we still had about 30km ahead of us to finish the day. It was humbling to see all the BRO folks working to keep the roads open and functional! A big salute to them! Each time we had a truck or some bikers pass by, we would wave at them or show thumbs up, and it would give us some additional energy to keep pushing ahead. The tree covered road in Sissu was just mind blowingly beautiful, with all the trees golden and yellow, preparing for the fall. It was also nice to turn 30, in the hills. Vivek tried to make it as special, for me, as he could. The cold. (See, the answer on why we didn’t finish the ride). On the night we camped at Sarchu, the water in our bottles and unwashed cups had frozen. We had gone to sub zero temperatures on many nights, it looks like. The winds during the day were quite chilly, and got worse as we gained altitude. We met a guy from Slovenia who has been taking a couple or so months off for the past 10 years. He was riding around with a 55kg weighing bike for the past 3 weeks, and was going from Leh to Manali, when we met him. He had a lot of stories to tell – including recommending that we go cycling in Iceland, and enjoy watching the Northern lights from hot water baths. Shabu himself had a lot of stories to tell about all the people he had taken on this ride - from guys with a $6k bike to a 70 year old doing the route his 4th time to the guy who would eat only olive oil mixed in rice to safeguard his tummy, and more! All the aachos and aamas in the shops/guest houses/etc that we went to were really nice to us. Most of the folks in the shops were planning to leave in a few days after we had met them since it had gotten really cold. We had our camp-site at Marhi in the compound of a HP state guest house. The care taker walks up to us, while we are setting up the tent, and says, “Idhar kahi par bhi baithna mana hai, 10 hazaar ka fine lag jaayega. Udhar toilet bana hua hai”, pointing to the public toilets in a distance, “paisa nahi lagega”. We had a good laugh, and ended up wondering if it was Swach Bharat showing some effect. We probably would’ve talked to a lot more people, and met a lot more interesting people, if we were there in better weather and didn’t have a support vehicle taking care of us. Next time! May be. We feel like we got a taste of the challenge of the ride, and the rest of the route wouldn’t be anymore challenging than what we already saw, if we did it in better weather. But, the better weather would also mean more traffic and noise on the road. Late August to mid-September might be a better time. We’d also need to look out for rains and land-slides, though. You can find some pictures and videos here. The album also includes some pictures from our practice rides.